Shop directly at thousands of your favorite stores through Shopathome.com or by using our Savings Button. Take surveys and get rewarded with Cash Back instantly. New surveys are added daily and we'll find the ones that best fit you. Receive offers in your inbox you won`t find anywhere else. We will send you the best deals and updates from the stores you love. 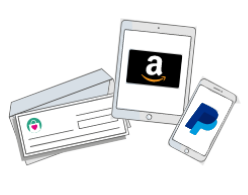 Once you have accumulated $20* in Cash Back you can choose to have your money sent through PayPal, a Check or an Amazon giftcard. Sit back and relax! Our Saving Button will automatically remind you of Cash back opportunities while you shop.